PROUDLY SUPPORTING AUSTRALIAN SUPPLIERS We stock Australian Made furniture that offers unmatched quality and workmanship. NEED FINANCE? Finance options available at many of our stores. With 70 stores across Australia, there’s a Homemakers store just around the corner. 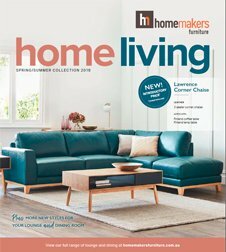 See the latest range of furniture in Homemakers “Home Living” Collection catalogue. Homemakers are your local furniture experts. Independently owned and operated. We’re locals, taking care of locals. Dedicated to providing our customers with a great range of furniture at great prices.